Did you have a sewer backup overnight and have to call an emergency plumber? What if you had to do that over and over again? The emergency plumber repair bills add up in a hurry. And the problem isn’t really getting fixed. This is because the plumber is probably using a regular plumbers snake to punch through a clog and get your pipes flowing again. The problem is that when the clog is just punched through it can quickly become closed up again. Only that small hole is made. The majority of the clog could still be there, just allowing flow through until something else gums up the pipes again. You could call a plumber ten times inside of six months and never really fix the problem. We can make a difference with hydro jetting your pipes. 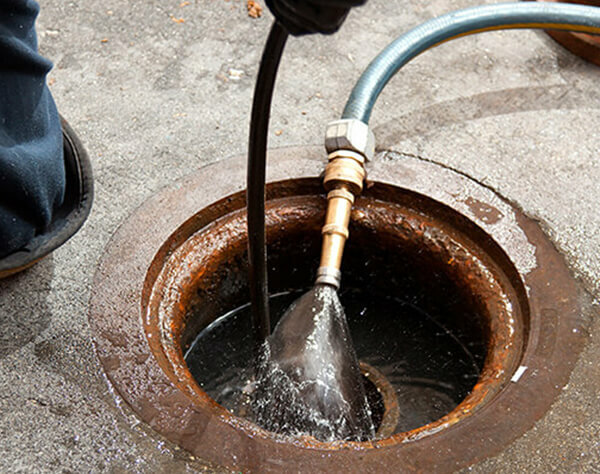 Hydro jetting allows us to completely clean your sewer line so that no part of any clog exists. The sides of the pipes will be clean, not just a hole through the debris. With hydro jetting you can be certain that you will not have any more sewer backups into your home. Hydro jetting is cost effective. When compared to the cost of constant plumber bills, hydro jetting is a worthwhile investment. It can save you a lot of money in plumber bills as well as saving you from damage to your home or belongings due to a sewer backup. Hydro jetting also makes sense from a full maintenance standpoint. You will not have to worry about maintenance for up to one year because the cleaning will take care of all debris in the line. It takes quite a while for build up to become a blockage issue. Before hydro jetting your sewer line we will dig a small access point to get to the sewer line. We will then use a video camera inspection to visually see the problem areas. If we cannot see the pipe due to a blockage we will punch through the clog so we can see further into the pipe. Once we have identified problem areas and ensured that the hydro jetting will be the solution to your sewer problem, we use our tools to jet a 4000 psi stream of water into the sewer. In many cases more than one pass might need to be made to make sure that the sewer line is completely clean. When the hydro jetting is complete we will do another video inspection to make sure that we have resolved your sewer issues. Call us today for a free estimate! Call us at 978-833-3431.